Pump action shotguns have been in existence for the longest time. In fact, the very first patent for this firearm design was issued in 1854 in Great Britain. Since then, they have been popular for social purposes like hunting. Today, there are so many types and brands of pump action guns on the market that it’s difficult to know which is the most suitable for you. However, here are eight great choices that you will love. We’ve chosen these shotguns based on reliability, looks, and performance overall. CZ does not only make top-notch pistols but also top-of-the-line pump action shotguns. The CZ 612 is one such example. It has an aluminum receiver which perfectly blends strength and lightness. It also utilizes a dual-action mechanism that offers very little recoil force. There’s a safety mode button on the rear of the trigger, which is only available in high-end shotguns. Perfect for trap with a raised rib and Monte Carlo stock, the CZ612 costs between $500 and $600. It’s a reliable shotgun that guarantees you top performance in shooting competitions. What more could you want? These Remingtons are best-selling pump action shotguns that get the job done. It’s quite versatile too. It is for hunters, law enforcement officers, and homeowners. With its 26 to 28-inch vent rib barrel, a magazine capacity of up to 7 rounds, and a Modified Rem Choke, the Remington 870 XP offers great performance and durability at its best. It can shoot 2.75, 3, or 3.5-inch shells quickly and safely, and if you want more precision, you can use the ghost ring sights that come with it. With its simplicity, versatility, and affordability at $450 to $500, the Remington 870 XP is a good all-round pump-action shotgun that you can certainly rely on. 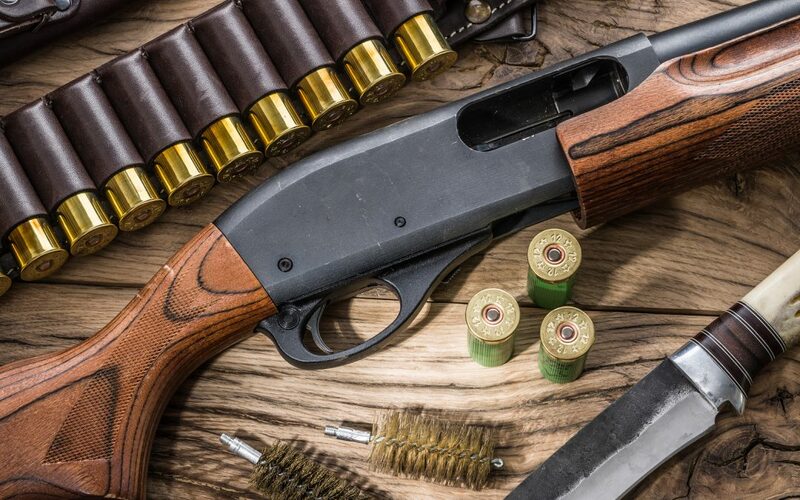 That is one of the best home self-defense pump-action shotguns on this list. Its inertia-assisted mechanism, 18-inch choked barrel, and fixed cylinder gives it a fast and smooth action that’s perfect for buckshot. The Winchester features a hard chrome-plated chamber and bore, which is resistant to corrosion, textured gripping surfaces, and an inflex tech recoil pad for less flinch. At an affordable price point of $350 to $400, you can own this lightweight and handy 12 gauge shotgun from a solid gun manufacturer. In hunting, Mossberg shotguns are always the best, and the Mossberg 500 is no exception. It comes with twin action bars, twin bead sights, anti-jam elevators, and a tang safety. With a wide range of barrel lengths and calibers, you will definitely be able to find one to suit your needs and preferences. For instance, with a budget of less than $400, you can get yourself a 28-inch matte black synthetic or wood stock 12-gauge Mossberg 500 shotgun. It’s durability, versatility, and affordability that makes the Mossberg 500 series a great choice for hunters desiring quality at a good price. You can purchase one of these shotguns for $400 to $600. The Weatherby PA-08 is also great for hunting. It weighs 7.25 pounds and has a 28-inch barrel that comes with unique but simple screw-in choke tubes. With the PA-08, shooting 3-inch shells is a piece of cake –- making it a great choice for a full day of hunting the game of your liking. It’s also durable and easily camouflages to its immediate environment. Built with waterfowlers in mind, this is one pump action shotgun to consider for your next expedition. Although difficult to buy online, you can check your local brick and mortar for this shotgun. It will cost you about $750 to $1,100. The Benelli series are durable enough to withstand any kind of outdoor activity, and the Nova is no exception. It has inertia-operated automatic loaders and a sporty lined design that’s fitted with deep grooves instead of the traditional checkering. That guarantees you a solid grip and maximum ergonomic performance. The Benelli Nova is lightweight, uses 3.5-inch magnums and comes in a 12 or 20 gauge. You’ll also find a wide trigger guard and a contoured forehand to fit different hand sizes. The Benelli Nova series will cost about $400 to $500 at most distributors. The 887 Nitro Mag is quite durable –- the barrel and receiver are covered with glass-reinforced nylon to safeguard the metallic interiors, while its ArmorLokt finish design withstands tough weather conditions. So, there are no external places to rust. It has an extended over decoy choke made for non-toxic waterfowl loads and a camouflaging designing, making it a great choice for hunting. The 887 has a smooth pump action that recycles without a hitch, and the Supercell recoil pad reduces recoil by half. With a 28-inch barrel, 12-gauge shotgun pump, 4-round capacity, and standard safety, the 887 Nitro Mag is a definite must-have. The 24-inch Mossberg 835 is durable and reliable. With dual action bars, twin extractors, and anti-jam elevators, it one of the best 12-gauge shotguns for accurate shots. It comes with a six-round capacity mag, that can handle 2.75, 3, and 3.5-inch shells. The 835 features a strategically positioned safety, an adjustable trigger, and an adjustable fiber optic sight in the rear for more precise shots. The unique design makes it perfect for small game because the low recoil and muzzle jump allows for quick follow-up shots. The Mossberg 835 is available for a price of $600 to $700. Pump action shotguns are typically a little safer than other types of guns. They come in a variety of gauges for different activities including hunting, sports, and self-defense. Their increasing popularity is because of their ease of use and safety. They may need a little manipulation to fire, but if you get the hang of them, you will never go back. Get yourself one of these shotguns for top-notch pump action performance.